one block West of Preston Rd. on the North side. Come check out our PRE-OWNED EQUIPMENT --only available in Fall and Winter. 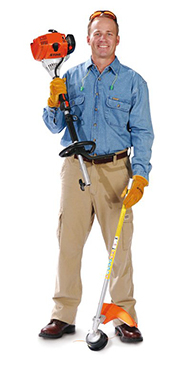 We have: Walk mowers, line trimmers, edgers, blowers, pressure washers and more. All pre-owned equipment is sold with warranties. For service specials and repairs click our Service Tab. Honda Generators: Take advantage of our discounted prices. Tip: Never have generators shipped...long term damage can occur that presents itself after the warranty has past. Looking for a great deal on reliable lawn care equipment? Need repairs for your power equipment? Whether you are a landscaper or a homeowner, Frisco Lawn and Power is the place to go for both lawn equipment sales and service. We are located on Main Street, one block west of Preston Road on the North Side. Stop by today to shop our extensive selection of or to get affordable lawn mower maintenance in Frisco, TX. No matter what type of lawn equipment you’re looking for, we’ve got it. We’re proud to sell a variety of trusted brands, including Stihl, Toro, Honda, Shindaiwa, and Echo. Stihl KM56-RCE Kombi System: The Stihl KM56-RCE Kombi System is the most versatile accessory system on the market today. You get the capability of several standalone components in one high-quality package; this power head is powerful enough to get the toughest jobs done and keep going. The Stihl KM56-RCE and the KombiSystem attachments make a complete system capable of taking care of your lawn maintenance needs. Talk to our lawn care tool sales team to learn more or click here to see the full catalogue from Stihl. Don’t trust just anyone with your lawn care power equipment. When you need repairs for your equipment, stop by our store to see technicians you can rely on to do the job right. We always take the time to get to the bottom of your problem and determine the best fix. Furthermore, we are happy to answer any questions you may have about the issue you are experiencing and our proposed solution. Service is available for all the brands we carry in our professional repair shop, which is equipped to do anything from basic tune-up services to complete engine overhaul and engine replacement. Routine lawn care power tool maintenance is also available. For service specials and repairs, check out our Service page. Why Buy from a power equipment dealer? We take the time to make sure you are comfortable with the operation and maintenance of your new equipment. We register your new equipment with the manufacturer--so any future warranty work is easily processed. Your equipment is fully assembled and tested before you leave the store. Based on input from our service department, we only sell models that have proven the test of time for durability and performance. We service what we sell. Our on-site service department will take care of repairs, maintenance or any warranty work to ensure you are completely satisfied with your power equipment. Our lawn care sales team offers tips and information to keep your equipment running its best throughout its lifetime--including the crucial winter months when you are storing your valuable equipment. Frisco Lawn and Power Equipment was established in Frisco, Texas in 2001. We are the trusted parts, equipment, and service supplier to most of the professional landscapers in the area, so we have the experience to repair your yard care equipment correctly the first time, every time. In addition, our dealership gives you sound advice that is based on the knowledge that can only come from nearly two decades of business. Our store is a dealer of various major brands of outdoor power equipment, including but not limited to: Honda, Toro, Briggs & Stratton, Snapper, Stihl, and Echo. During the winter months of November through February, pre-owned lawn care equipment sales are available for various brands. Visit us during these months for deals on brands such as Craftsman, Troybilt, Bearcat, Husqvarna, and John Deere. We are also a dealer of zero turn mowers, also known as ZTR mowers. Zero turn mowers from Toro and Snapper are in stock now and ready for delivery. Contact us to learn more about our lawn care equipment for sale and affordable repair services. We are located in Frisco, Texas, and serve residential and commercial customers from throughout the area. Blade sharpen of unit coupon. Have you seen our How-To videos? 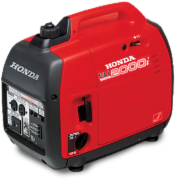 Honda Generators: Take advantage of our discounted prices on generators from Honda Power Equipment. These generators give you the power you need when and where you need it most--not to mention they are extremely quiet. Please note that we recommend you never have generators shipped. Long-term damage can occur that presents itself after the warranty has passed.